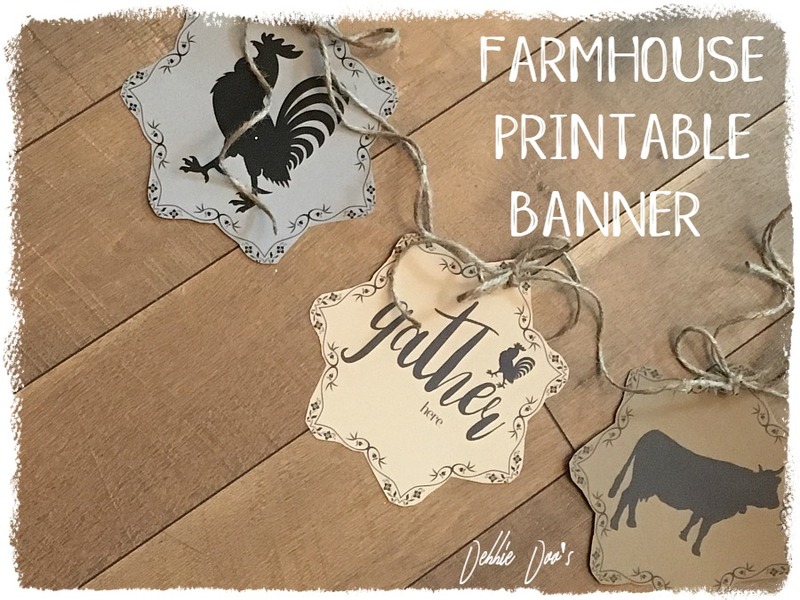 Deb creates her own stencils and home goods! 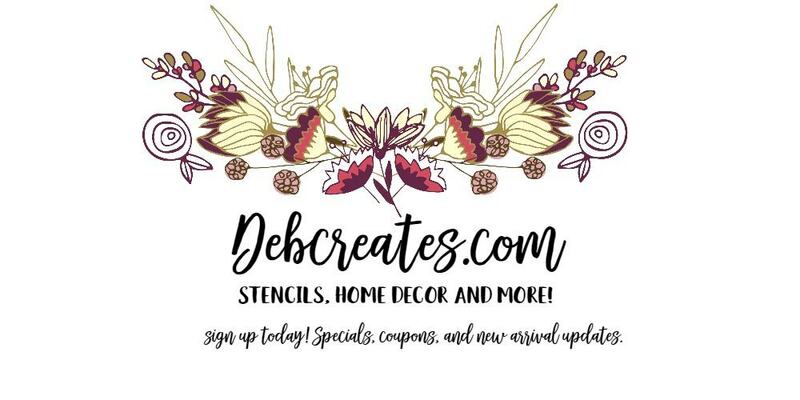 Hi there and welcome to debcreates.com. This is where you can view all my stencil projects created with my own exclusive stencil line. Thanks for checking it out. I hope you feel inspired. Debbiedoo’s was established in 2009 with keeping in mind creating a warm, friendly, welcoming home with a small budget. Hence, “home was not built in a day”. I have been stenciling since way back in the 80’s. When I realized early on in childhood that I could never truly be an artist, simply because I can’t even draw a stick man. However, I can stencil like supaaa star:) In fact, I believe you can too. I have heard time and time again that you just can’t get it right. I created my line with newbies in mind, and experts as well. You will find my stencils to be extremely user friendly and even not so perfect in a rustic sort of way. Soon you too will be creating beautiful home decor items on a friendly budget. You will be gifting your creations and perhaps even selling them. 1.Do you like receiving thoughtful home made gifts? 2. Do you like making home made gifts? 3. Do you enjoy changing up your decor per season but don’t have a big budget to do so? If the answer is yes to any of the above, stencils are the perfect little investment for you! With my exclusive stencil line you can mix and match all 6 to create unique pieces. No two ever have to be the same. What other stencils do you know can do that? As an extra bonus and gift to you. 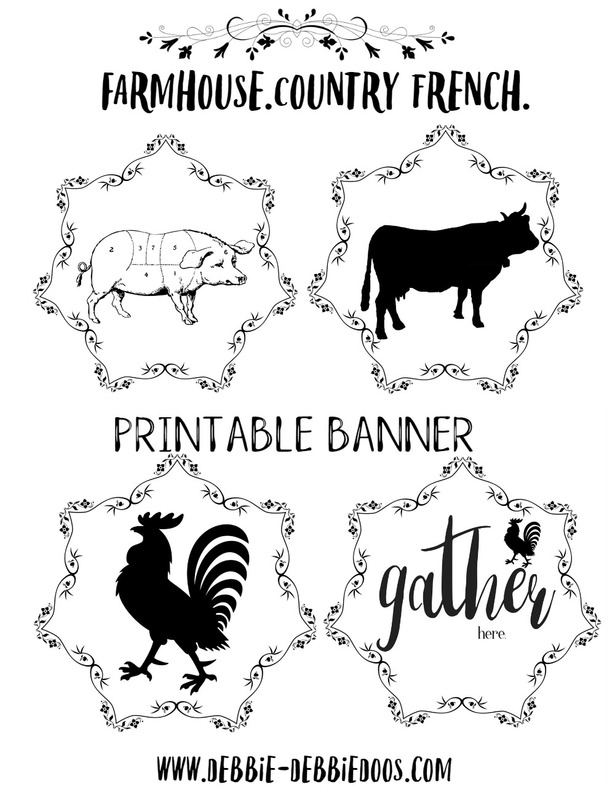 Each stencil purchase comes with a custom PDF download for these awesome Farmhouse printables. Print individually or perhaps make a cute banner as shown here. They are yours to do with what you like. The PDF file will come in a follow up email to you within a day after purchase. Thanks so much. FOUR custom high quality graphic designs. Mix and match my stencil line or simply buy all 6. Sign up today to stay up to date. I also want to make mention that my stencil line is not backed by any major retail store. I designed my line, and found a US supplier to create my designs. You will notice that most all stencils are made in China. They are made for much less over there, opposed to the US. That is indeed why you will see the price difference of a buck or two you will pay more with mine. Not to mention, these truly are ONE-OF-A-KIND and made with you in mind. I’m thankful to be on the Amazon selling platform. You can buy with confidence that you will be receiving top notch customer service. You can create many home decor items, gifts and things for your very own shop if you have one. If you are not so crafty, think of your crafty friends that are. What a cute gift this would make for them with a pack of tea towels, or a small crates, etc. The ideas are endless. Enjoy. Below you will find examples of how the stencils look on your project. Whether you create on wood, furniture, fabric, burlap, and more, your designs and creations will sure to be a hit. Any questions, please feel free to contact me at micmanno@aol.com. Thank you. Please click the InLinkz down below to view my gallery in a clean easy to read format. Thank you.